Beggars All: Reformation And Apologetics: Steve Ray's "Always reforming, always in need of reform"
James wrote, "Yeah, you know all those Protestants with their differing interpretations, it's good thing Rome doesn't have that problem." You are correct Rome does not have that problem. The only problem The Catholic Church has is that idiots will not follow her official teaching. That is the problem. So I guess you are going to say that everyone who disagreed with Jesus, including one of his apostles proves that Jesus was not God or he was not the ultimate authority? This type of argumentation is growing tiresome. The division that arises from your authority of Scripture Alone is not comparable to people in the Catholic Church who dissent from clear official Church teaching. 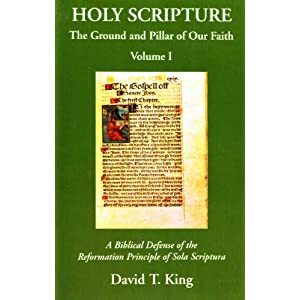 The reason that people are divided in the realm of Sola Scriptura is that you all cannot agree on an interpretation of major Church doctrines. You can't even agree on what baptism is. The Catholic Church does not have that problem. The reason we have dissenters in the Catholic Church is from obstinate resistance to clear Church teaching that has been defined for the better part of 2000 years. Sorry, the two do not equate. d) Whether Ratzinger was right or not (as to what Romanism requires), prohibiting disagreement over fallible teachings is just silly - and those who call people idiots for disagreeing with fallible teachings seem to lack an appreciation of the difference between the ordinary and extrordinary magisterium. I wonder why Steve Ray thinks that's a motto of his church? The RCC, I don't think so (quite the opposite in fact - see my notes in the comment box of this post. I'm not aware of the origin of "Always reforming, always in need of reform." I've never looked in to it, and I don't have a more than a very mild curious interest in its origins. I've spoken with a few Reformed individuals that truly dislike the slogan. I'm somewhat indifferent to it myself. If all it implies is that the Church must continually be conformed to the Word of God, then I'm very much at peace with the slogan. As to Steve Ray's use, I admit, it's the first time I've ever come across a Roman Catholic using it. I doubt Mr. Ray understands the slogan in the way I do. If he did, he would not be Roman Catholic. The division that arises from your authority of Scripture Alone is not comparable to people in the Catholic Church who dissent from clear official Church teaching. The irony of course, is that if you visit Mr. Ray's website I took this from, he has a PDF in which he goes on and for about 13 pages giving his own exegesis and private opinion as a response. Why would I believe Matthew Bellisario and Steve Ray over hundreds of RC priests? Well, because they interpret Rome correctly for us anti-Catholics, unlike liberal seminary trained priests. Rhology says, "Why would I believe Matthew Bellisario and Steve Ray over hundreds of RC priests?" Its not about believing individuals. This goes to show you have no clue as to how Catholicism defines doctrine. If you are still making comparisons like this then you have a long way to go before you can even dialog competently about the Catholic faith. The issues, as far as I can see, are a little deeper than whether particular Catholics happen to have a private opinion or not. The issue is that RC apologists are always pointing out any difference in the interpretation of Scripture as proof of a fatal flaw in using Scripture as an authority, while the RC has the Majesterium to "take care" of these issues because the Majesterium will pretty much settle most, if not every single, issue. The problem with the model advanced in this space is that, apparently, a layman can say that a Majesterially approved seminary allows the teaching of error, which seems to have authority a little backwards--why is a layman's interpretation to be preferred to a trained theologian from a majesterially approved seminary? Furthermore, if the Majesterium cannot even make sure the seminaries teach correct doctrines, and thus priests who teach correct doctrines, the RC apologists' claims re Protestants ring a bit hollow because as a practical matter there are theological differences within RCism. Then, when I see things like "you have no clue as to how Catholicism defines doctrine" it looks like it is not a particular Protestant's understanding of that which is insufficient, but the ever shrinking "official" RC teaching is insufficient to cover something as significant as whether the feeding of the multitudes is a miracle or not. "I'm not aware of the origin of 'Always reforming, always in need of reform.'" "If all it implies is that the Church must continually be conformed to the Word of God, then I'm very much at peace with the slogan." I've never known semper reformanda to mean anything other than that, but I could be mistaken. If so, I'd like to know. However, I've never heard a Catholic use the term in their description of the RCC. I should think they would be very much opposed to the idea as it conflicts with, if not infallibility of the teaching offices, then certainly with the idea of the Church of Christ being a perfect institution here on earth. I have discussed this with several Catholics who disavow my understanding that Christ's Church on earth is not perfect due to its makeup of sinful, flawed individuals. 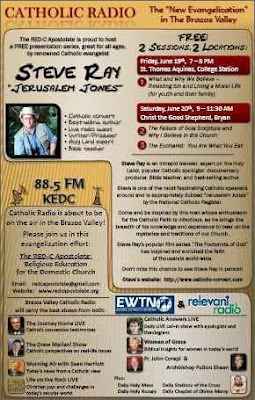 And yet, Catholics don't seem to mind Steve Ray's use of the term. Even Mr. Bellisario didn't address it here. I'm wondering if he would tackle that specific question for us? Perhaps the issue is doctrine (which does not change) versus practice (which may appropriately change)? S.Ray puts this reinterpretation of the miracle together w/ those who broke w/ established church teaching and practice. Also, his blog title uses the word heresy. Heresy is a corruption/defection from the faith. No Protestant would disagree w/ this. Since the faith (whole and entire) is preserved outside the RCC, then judge if Ray's lamentation is based on the truth. Here's a task: Try to judge the truth between Machen and the "liberals". I think Ray sees this reforming in the fading 70s/returning to sanity taking place. Wow! All this w/out a magisterial inquisition. "This goes to show you have no clue as to how Catholicism defines doctrine." "The reason we have dissenters in the Catholic Church is from obstinate resistance to clear Church teaching that has been defined for the better part of 2000 years." Edward wrote. "The problem with the model advanced in this space is that, apparently, a layman can say that a Majesterially approved seminary allows the teaching of error, which seems to have authority a little backwards--why is a layman's interpretation to be preferred to a trained theologian from a majesterially approved seminary?" I disagree with your assessment. If a seminary is teaching against an official doctrine of the Church then a layperson pointing it out is not the authority. The layperson is merely pointing out the official Church documents that state the seminaries teaching is in error. If we were to use your logic then any person expounding on the text of Scripture is also usurping the authority of Scripture. This would be the same as a layperson quoting the Church documents. I see no argument from that position. Just because a seminary is "Catholic" does not mean that it is properly "policed" by individuals in the Church. MB: "I disagree with your assessment. If a seminary is teaching against an official doctrine of the Church then a layperson pointing it out is not the authority. The layperson is merely pointing out the official Church documents that state the seminaries teaching is in error." Presumably the seminary is under the authority of the local bishop, and the bishop is under other prelates going all the way up to the pope. If the hierarchy, i.e. the Majesterium, which is supposed to take care of these issues, does not stop the heresy, why should a layman's claims be given any weight at all? A layperson challenging something the Majesterium itself has let be sounds like private judgment to me, not submission to authority. MB: "I see no argument from that position. Just because a seminary is "Catholic" does not mean that it is properly "policed" by individuals in the Church." Then what practical good is the Majesterium? A Majesterium which either does not or cannot police its own seminaries--which are supposed to promulgate the very infallible teachings which give RCism its alleged unity--is not very useful at all. Also, it is not your call to say which seminary is Catholic or "Catholic", that is the call of the hierarchy, which by permitting these teachings within its seminaries is giving implicit approval of the content of the teachings. The seminary does not equal Magisterium. That is your error. one bishop does not equal Magisterium, another error. One individual does not equal Magisterium, a third error. What the Church decides on a whole with its official documents in unity with the Chair of Peter over the centuries is what you should be looking at. Your fallacious concept of what the Church is, is what is hindering your understanding in my opinion. An individual going to the Church and her official teaching is like an individual following a speed sign on a road that says 55. Then a guy comes by and tells him that no the speed limit is 70. Well the guy who points to the sign that says 55 is not the authority. He is pointing to the sign that says 55 which the state put there, which is the authority. It is no different than a layperson quoting an official Church teaching that has been documented many times over by the Church. If a seminary or an individual bishop does not follow the speed signs than anyone can tell them so, period. It does not upset the apple cart like you insist it does. Sorry, I don't buy this weak argument, and no one else should either. I did not say the seminary equals the Majesterium, nor did I say that one person equals the Majesterium. I said that the Majesterium controls the seminaries, and if it cannot or will not do so in an orthodox manner, it is, as a practical matter, useless for unity because the seminaries are teaching the priests, future bishops, cardinals and possible popes, of the RCC. If they teach something wrong--and teaching is the sine qua non of the Majesterium--I don;t see what use it is. Now, either the Majesterium is unaware of what the seminary teaches, or it does not care what the seminary teaches. Both are troublesome if the Majesterium is supposed to foment doctrinal unity. MB: "An individual going to the Church and her official teaching is like an individual following a speed sign on a road that says 55." How do you, a layman, know that it is not the seminary which is correct, and you who got it wrong? The brute fact is that the seminary, according to Steve ray, is teaching something patently wrong. Well, by what authority can he do so while maintaining submission to the Majesterium? The Majesterium itself is silent on the issue, allowing a seminary to teach things which are, on their face, wrong according to Steve Ray. Why should I or anyone take Steve ray's opinion over those of theologians and clergy educated in the RC theological tradition? Yup, Edward Reiss has it exactly right. MB, I could go ask a priest about this, or I could ask you and Steve Ray. Where does one have access to "the Magisterium"? Doesn't one instead have access to ***A*** priest? So the priest tells me one thing, you tell me another...I'm going with the priest. Else, would I not be Protestantising, going with my private fallible interpretation of a Magisterial document over and above what my priest told me? Matt, give it up. You are wasting your time by continuing to argue with these people. They are clearly not trying to engage in any helpful discussion whatsoever, they are just arguing to argue. If a cop tells me that I can do 40mph in a residential area, and you tell me that the laws of the state say that I can only do 25mph in a residential area unless otherwise posted, who the heck are you to tell me that the cop is wrong. I’m going with the cop. Look, I don’t very much care if you can show me the state laws, the cop is a greater authority and my lack of intelligence and rank incompetence keeps me from doing any further investigation. I just cannot accept the possibility that the cop might have an ulterior agenda that is not in accordance with the state. The fact that the state doesn’t do a better job at policing its police, and allows them to get the facts wrong shows that there isn’t much of a need for the state. Anarchy must be more logical. Your analogy would be better if you said that the laws (magisterial decrees) say that I can only do 25 mph, but the only people who can tell me that are cops (priests), b/c I am just one person, fallible, who could misinterp the laws. When dozens of cops tell me it's 40, why would I believe some random guy (ie, you, or MB or Steve Ray) who comes along to tell me that it's actually 25? After all, it's a common RC argument that an indiv interp shouldn't be trusted, since it's just one indiv, who is fallible. So when someone argues that when the NT says "by grace you've been saved, thru faith...NOT BY WORKS", it actually means "by grace thru faith AND works", b/c the RCC tells us so. I just got it wrong b/c I'm fallible. "After all, it's a common RC argument that an indiv interp shouldn't be trusted, since it's just one indiv, who is fallible. So when someone argues that when the NT says "by grace you've been saved, thru faith...NOT BY WORKS", it actually means "by grace thru faith AND works", b/c the RCC tells us so. I just got it wrong b/c I'm fallible." This is the issue. If the RC apologists didn't use the "private judgment" argument so often, it would not be a big issue. On the terms of the private judgment argument as I have seen used on the Web, an RC who does anything more than prayerfully notify his bishop and/or priest of something he privately believes is irregular is engaging in private judgment of the hierarchy--the very thing many RC apologists accuse Protestants of doing. As a corollary, if different interpretations of the Scriptures show the non-perspicuity of the Scriptures, then a RC seminary teaching Jesus' words moved people to share the food they had brought with them already shows the non-perspicuity of the Church's teaching on whether that is a miracle or not. For that reason alone, placing scare quotes around "Catholic" regarding a seminary which teaches that is private judgment, as at best the issue has not been decided by the Majesterium. It is not our fault this argument used by RC apologists is so readily turned against the RC apologists themselves. It probably means there is a severe flaw in the private judgment argument as typically used by RCs instead of us allegedly arguing for arguments sake. The basic problem with the Catholic apologetics "private judgment" argument is that it is directed at a defective understanding of the relationship of private individuals to the corporate bodies of which they are a part. As everyone from the ancient Greeks to the ancient Hebrews to the Protestant Reformers themselves recognized, human beings are social creatures, not isolated individual units determining all things for and by themselves. Human beings inevitably seek to form communities in which individuals relate to other individuals for the purpose of common goals. Although in properly-ordered communities, individual members have a high degree of personal freedom, the only way that communities can survive in the long term is for there to be standards which can occasionally override individual concerns in the name of the health of the corporate body. Whether Roman Catholic or Presbyterian or even Reformed Baptist, all communities of necessity police their boundaries and have methods of dealing with individual members who threaten the integrity of the whole. The problem with the RC apologist "private judgment" argument is that it assumes that Protestantism (the whole generalized community) is of necessity a chaotic mass of individuals who all think of themselves as their very own personal islands - monistic societies made up of "me, myself, and I - and who cares about the rest of the world." While no doubt some Protestants do think and act this way, it is a fundamentally unChristian (and in fact un-human) way of thinking and acting. If in fact Protestantism (speaking of the whole generalized community) was inherently and inescapably socially monistic, the RC apologist argument would have a devastating point. But in fact Protestantism is not this way; only occasionally individual Protestants, operating in a morally and communally defective manner, are this way. Again, all Protestant denominations have ways (varying) of policing their boundaries and dealing with severely disruptive individuals. Every Protestant individual (like all human individuals of whatever community or culture) is at one and the same time a private person and a public person. As a private person, he has the absolute God-given right to think whatever thoughts he wishes inside his own head, and no external power can do anything about this "liberty of conscience." Liberty of conscience is unregulatable and unassailable, and is a simple given of human existence under God. The flipside, however, liberty of public expression of the contents of private conscience, is not an absolute God-given right. For when the private person's private opinions threaten the integrity of the whole body, the whole body has a duty to respond in a self-preserving way. Everyone, even the most radical Lockean individualist, intuitively understands that if an arm or a leg becomes incurably gangrenous, the only thing to do is to cut it off so that the whole body does not die. Scripture itself attests to the truth of this principle with the example of Caiaphas, who, though an apostate, truly prophesied that it is expedient for one man to die (so that the whole people can be saved). The point of all this is that there are no morally healthy Protestant groups which would hold to an absolute right of every individual member of their corporate body to promulgate just whatever he wished, regardless of community standards. Private people must recognize the limits of their private judgment when it comes to affecting the public body of which they are a part. Private people must be responsible public people. The problem with the RC apologist argument is that it does not recognize that "on the ground" in actual day-to-day living, all Protestant groups recognize and live by this basic distinction. Excepting unhealthy (and so, dying) bodies, there is simply no such thing in real daily life as the kind of "private judgment" that RC apologists make the centerpiece of their authority arguments against Protestants. As with many other areas of thought (notably the fundamentally irrational "You need an infallible identifier / interpreter of the Bible" argument), lay RC apologists are inadequately grounded in basic human truths - not to mention basic Christian truths - and so wind up wasting immense amounts of time on trivial non-arguments that any decently-read person trying to do apologetics would make sure he had right BEFORE swaggering out onto the Internet to "defend the Faith" and "destroy the heretics." You are correct Alex. These people are not making any rational argumentation. If they cannot understand simple logic, then the posting ends for me here on this subject. The problem for Catholics is not private judgment, because the Church is the living entity that provides us with its official teaching. If these guys cannot even grasp the point the the police are not the ultimate authority over the speed limits, how are they going to grasp the Catholic Church? They wont, and they don't. Ohh well. "if these guys cannot even grasp the point the the police are not the ultimate authority over the speed limits, how are they going to grasp the Catholic Church? They wont, and they don't." "The point of all this is that there are no morally healthy Protestant groups which would hold to an absolute right of every individual member of their corporate body to promulgate just whatever he wished, regardless of community standards." This is good to hear, but would this also apply to Luther in relation to the Church he belonged? And, from where do Protestant groups (made up of individuals)get the right and power to disallow others from acting as they wish?